Peter Rouff, a Republican orthodontist running for a seat on the Buffalo Common Council, showed up on my porch campaigning two weeks ago. That was a bit of an oddity—not the part about a candidate showing up on the porch, but that a Republican was actually running a serious campaign for elected office in the City of Buffalo. The last time a registered Republican served on the council was in the early 1980s. He seemed like a nice guy. I allowed him to squeeze my hand and lift and lower it while exchanging smiles. So I had to ask him: “How’d you get associated with a hate group?” He didn’t feign confusion or miss a beat, firing back, “That’s some harsh language.” It is. At that point, as much as I wanted to, I didn’t bring up racist voter suppression laws Republicans are enacting around the country, or how elected Republicans are railing against religious minorities, or their legislative attempts to stop loving couples from marrying or adopting children, or their war to defund women’s clinics, or any of dozens of other examples of a well coordinated national hate group trying to undermine civil rights and oppress minorities across the country. I kept it local. I asked him how he could affiliate himself with the local Republican party, given the unabashed racism they celebrated earlier this year, for example, on their official Facebook page, which at the time was moderated by Tracey McNerney, the chair of the City of Buffalo Republican Committee (see my piece in the 1/17/15 edition of The Public entitled “The Year of the Racist”). That would be the same Tracey McNerney who told the Buffalo News, “When Dr. Rouff stepped forward, we knew we had a quality candidate.” The Republican Committee Facebook page joked about needing a lump of coal to put President Obama’s head on Mount Rushmore, promoted notions of an epidemic of black on white “hate crimes” and other such drivel. Rouff struck me as a nice guy, but it seemed he was falling in with a bad crowd. I told him that both his time and mine would be better spent if he chose another porch on which to campaign. Soon after that day, Rouff’s new friends at the Buffalo Republican Committee soiled his name—in a sort of rite of passage, mailing out a race-bating campaign piece from his “Friends of Peter Rouff” campaign committee. Gently coded and bathed in plausible deniability, the mailing only mentions Rouff in the return address, presenting its core message though two doctored photos creating an associational juxtaposing of his Democratic opponent, Joel Feroleto, with an African-American former state senator, Antoine Thompson, in whose office he worked as a legislative aid six years ago. Thompson served three terms on the City Council followed by two terms in the Senate, where he rose to head the Senate Environmental Conservation Committee, and spearheaded a statewide moratorium on fracking. After two terms Thompson lost his seat in 2010, finding himself outmaneuvered and without adequate support in a nasty election campaign that at one point attacked him for the long length of his office’s annual activity report—the “scandal” being that it cost more tax dollars to copy than shorter reports from less productive legislative offices. Until recently Thompson was employed as the executive director of the City of Buffalo Employment and Training Center. The Rouff piece is adorned with a full-page photo of his Democratic opponent, Joel Feroleto, wearing a graduation costume while shaking hands with Thompson and receiving a diploma. On the top of the page it reads: “Joel Feroleto: Graduate of Antoine Thompson’s School of Bad Government.” On the bottom of the page it reads, “He Learned All The Wrong Lessons.” Feroleto’s hands are different colors, with the one that’s shaking Thompson’s hand, seemingly whitened so as to contrast with Thompson’s darker hand. 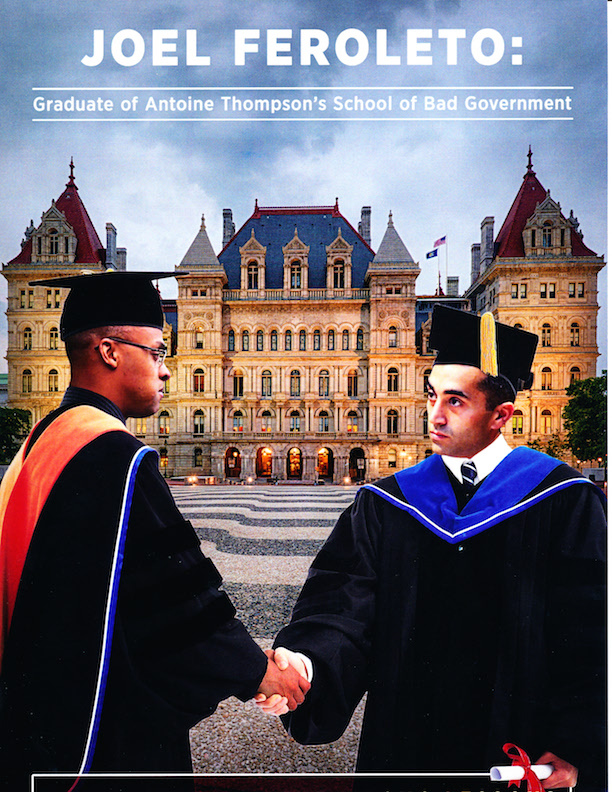 On the back of the flyer we see photos of Thompson and Feroleto on a mantle with a giant diploma from the “Thompson Bad Government School,” issued to a student by the name of “Joel Feroleto’s Diploma.” The piece accuses Feroleto of “serving as a top aide to former Senator Antoine Thompson, who has a record of pay-to-play politics.” This accusation is validated by an asterisk—the only one on the brochure. There is no source for the allegation on the mailing. The accusation, which stems from a campaign donation Thompson received and returned from a casino operator, was a mainstay in attack ads used against Thompson in 2010. Like I said, this mailing has plausible deniability. One can argue that it’s not racist. But if it’s not, then what exactly is it? Thompson is relatively obscure now. Whatever political power he might have once wielded is gone. Yet the Rouff mailing urges voters to “Stop Feroleto & Thompson Nov 3RD,” as if the defeated former senator is some sort of power broker. Voters received receiving a similar mailing this week, bearing photos of Thompson and Ferleto, again with no mention of Ruoff except on the return address. 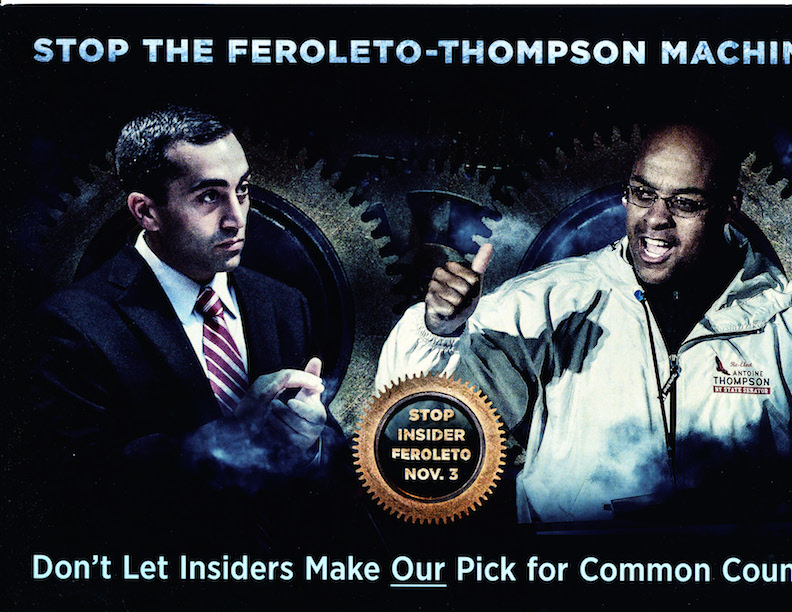 This one featured a full-page photo of a darker-skinned Thompson, in case anyone missed his racial identity on the first go-round, seemingly schooling Ferleto, sandwiched between two banners, one reading “Stop the Feroleto-Thompson Machine,” and the other reading, “Don’t let Insiders Make Our Pick for Common Council,” with “our” underlined in the original, as in don’t let them run our city. What the Buffalo Republicans sent out is a mailing linking Feroleto with the only black politician they knew they could connect him to. There’s really nothing else there. Thompson’s political career seems done. If there were a Thompson machine, he would still be in office. We’ve surely seen enough of these coded campaign pieces in Western New York to know what they are. And no doubt we’ll hear Republicans assure us that they’re not racially coded. But if they’re not racially coded, what are they? There’s a reason that Republicans don’t get elected in Buffalo. Rouff fell in with a bad crowd. Too bad. He seems like an interesting guy. But his handlers are running a campaign more fitting for 1980s Louisiana. That ain’t us.